Check out our Photo Peach of our trip to Busselton. 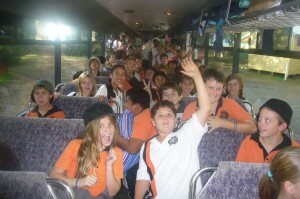 The year 6 and year 7 students of Cooinda have returned from Busselton Camp after a wonderful 3 days together. We got to know each other a whole lot better and had fun working together to make the camp run properly. The highlight of the camp for me was going to Nigilgi Cave and spending time with the students from the other two classes and my own, away from the classroom environment. Mr Phipps did an exceptional job on the food and the parent volunteers were such a great support for us over the three days. Miss Hill our student teacher even came along to learn about how camps come together. All students were happy, co-operative and willing to give everything a go. The students from Mrs B’s Team and The Den are going to post in their own personal blogs about their camping adventures in the next week, so keep your eyes out for that. A change is better than a holiday … so they told me. The two year 6/7 classes at CPS are fortunate enough to have the access to two classrooms each. This gives us all so much more room to establish some great learning centres and spread out when doing our group rotations. At the beginning of the week the Team decided that the room with our desks, IWB and computers in was getting a little over crowded and felt they had to try and encourage me to move some furniture around to give us more space. As I occasionally suffer with Obsessive Compulsive Disorder and am a ‘creature of habit’, I asked the students to write a persuasive text to either encourage me to move to the other end of the two rooms or stay.’ What ever argument held the majority vote I would go with that decision. We are now settled nicely into the other end of the class. One end has our desks and chairs, whilst the other end houses our computers, IWB and loads of extra floor space for our collaborative work. Today when Mrs Upson came to visit during Literacy Block, we were all able to spread out and access the ICT without knocking each other over. And …. as I have found out, a change is better than a holiday (well almost). P.S. Speaking of holidays (not that we can really call it that), we are off to camp next week. Very exciting! In the next few weeks, we are going to be typing and producing a book review on our favourite novels. The particular book I have chosen to review is called, ” Harry Potter and the Deathly Hallows”. The book I have chosen has about 600 pages in it. Every student in our class will be reading their favourite novel and then producing a book review which will be typed formally. When starting our reviews on OTLS, we must follow the on-screen instructions and read, ” How to write a book review”. And that’s what we are doing with our book reviews. For the last few weeks room 13 have been learning and doing a project about industries. All of the students in the class have groups of four people to put together their research. The group I am in is doing the dairy industry and so far it has been fun. My group is going to be presenting a report on the topic and will also be holding a morning tea so that everyone can try some dairy products. Some of the other topics people have chosen are wool, diamonds, oil, aluminium, paper and fisheries. I think that this project has been fun and I look foward to hearing the other groups reports. Our class has been learning a lot about Matter in Science. We learnt about atoms and the three states of Matter, solid, liquid and gas. After that our class went into pairs and got a piece of paper towel with shaving cream on it and we had to study it by describing its properties. It wasn’t very hard to describe because all we had to do was look at it and then write what it looked like.We then left it for a day see what would happen. The next day, we got into our pairs again and we had to describe what it looked like after we had left it.The shaving cream had become more bubbly and when we rubbed it between our fingers, it turned pastey. All in all, we had heaps of fun!!!! Today was the first day of NAPLAN. We started the morning with the students doing Language Conventions test and then following after lunch the Writing test. The Writing part of the test was titled “Too much money is spent on toys and games.”. The students then had to write a persuasive text either agreeing or disagreeing with the statement. As part of Term 1 all students were given weekly and daily activities that revolved around the construction of persuasive texts. From having a brief flick through the tests, I was very happy to see that almost all of them were written and presented very well. Fingers crossed the markers also think so. Over the next two weeks the students have been asked to read a novel that they either chose from the school library or the class resources. They are going to complete this book review on our Online Teaching and Learning System. Click on the Wall Wisher link on the right to see how we choose a book to read. Well that is it for today. Welcome to our class blog. We are hoping that this becomes a very useful tool for us and the school to showcase what we have been doing and to link to other wonderful classes around Western Australia, Australia or even the world. We are one of two classes of Year 6 and 7 students from Cooinda Primary School, Western Australia. Cooinda is located in the beautiful South West in Bunbury. We are all hoping to use this Blog to keep the wider community informed about the goings on in our class and at our school. I have called the Blog – Mrs B’s Team – Room 13, because we learn by the term “There is No ‘I’ in Team”.